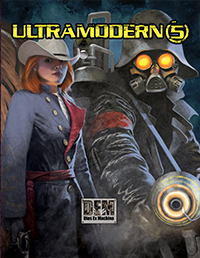 The mission of U5 is to present 5th EDITION rules for use in non-fantasy settings. You may explore the rules in whatever context you wish. Rules are generalized, encouraging homebrew settings and the rebranding of elements. Create a pure science fiction setting, or insert these rules into your own fantasy world to offer a unique spin. DISCLOSURE: Part of UM5 content is carried over from Amethyst: Quintessence. UM5 has expanded equipment and more classes. UM5 also includes the Lifepath system, different monsters, and two complete adventures.